Parasomnias are sleep-related disorders that disrupt sleep. They are characterized by undesirable physical or verbal behaviors or experiences. The most common types of parasomnias include nightmare disorder (also called dream anxiety attack), sleep terror disorder, sleepwalking disorder, REM sleep behavior disorder (RBD), and restless legs syndrome and periodic limb movement disorder. Symptoms of parasomnias depend on the disorder. Symptoms of nightmare disorder include frightening dreams and arousal during the dream. Symptoms of sleep terror disorder include a sudden arousal, crying out or screaming when the person is aroused, increased heart rate, rapid breathing, flushing, sweating, muscle spasms, incoherent speech, unresponsive to external stimuli, passing of urine, and, when awakened, is confused, disoriented, and does not remember the event. Symptoms of sleepwalking disorder include behaviors that range from simply sitting up in bed to walking, eating, or talking. Upon awakening, the person often is confused and does not remember the event. Symptoms of REM sleep behavior disorder include acting out of dreams that can include punching, kicking, leaping, and running from the bed. Arousals from sleep to alertness occur rapidly, and dreams can be vividly recalled. Symptoms of restless legs syndrome and periodic limb movement disorder discomfort in the legs (described as pulling, searing, crawling, creeping, and boring) that is relieved by moving the legs, walking about, rubbing the legs, squeezing or stroking the legs, and by taking hot showers or baths. Person complains of a frightening dream. Arousal during the dream is common. The presence of a dream is the essential feature that differentiates nightmare disorder from sleep terror disorder. A sleep terror is characterized by a sudden arousal. Commonly, the person cries out or screams as he or she is aroused. The person has an increased heart rate, an increase in the respiratory rate, flushing, sweating, and increased muscle tone. The person is routinely unresponsive to external stimuli and, when awakened, is confused, disoriented, and does not remember the event. Incoherent speech or passing of urine has been reported to accompany the event. Episodes of sleepwalking are associated with behaviors that range from simply sitting up in bed to walking, possibly with associated complex behaviors such as eating. Talking behavior has also been noted during episodes of sleepwalking. Upon awakening, the person most often is confused and does not remember the event. The event may spontaneously terminate, or the person may return to bed or lie down somewhere else and go off to sleep without waking up from sleep. The main feature of this disorder is the acting out of dreams. The behavior can include punching, kicking, leaping, and running from the bed. The most common reason for medical consultation is injury to the bed partner, although the effects of sleep disruption can also precipitate such consultation. The event occurs during REM sleep. 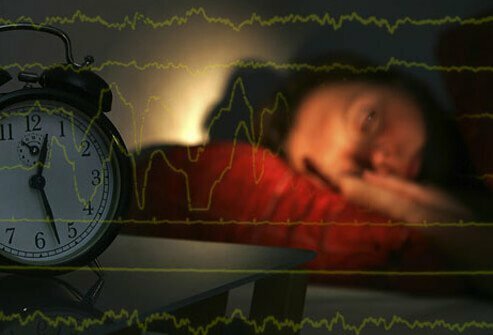 In persons with REM sleep behavior disorder, arousals from sleep to alertness and orientation occur rapidly, and they usually vividly recall their dreams. After awakening, the person’s behavior and interactions are normal. Acute (short-term) and chronic (long-term) forms exist. The acute form can emerge during withdrawal from ethanol or sedative-hypnotic abuse and with anticholinergic and other drug intoxication states. The chronic form presents for evaluation following observations of bed partners. Despite nighttime behavior, few persons develop excessive daytime sleepiness or fatigue. Persons with restless legs syndrome describe discomfort in the legs, using terms, such as “pulling, searing, crawling, creeping, and boring” to describe these sensations. The symptoms usually occur at bedtime or during other periods of inactivity. These distressing symptoms are relieved by moving the legs, walking about, rubbing the legs, squeezing or stroking the legs, and by taking hot showers or baths. The symptoms may wax and wane over the person’s lifetime. Persons with restless legs syndrome commonly present with complaints of insomnia (inability to initiate or return to sleep), and, in severe cases, the disorder may cause depression and suicidal thoughts. Periodic limb movement disorder primarily occurs during sleep. This disorder is described as rhythmic extension of the great toe, associated with dorsiflexion (upward movement) of the ankle and light flexion (bending) of the knee and hip. Because periodic limb movement disorder occurs during sleep, the symptoms are often not noticed by the person. Affected persons often complain of excessive daytime sleepiness, initially during passive activities, such as watching TV, being a passenger in a car, or reading. In later stages, one may have excessive daytime sleepiness during activities requiring alertness, such as driving, operating machinery, or talking with people. Restless legs syndrome and periodic limb movement disorder may occur even during childhood and may present clinically as attention deficit disorder with hyperactivity or as growing pains. Restless legs syndrome and periodic limb movement disorder are present in a significant percentage of pregnant women, and exacerbations are observed during menstruation and menopause. These disorders are associated with numerous neurological conditions, such as peripheral neuropathy, postpolio syndrome, and spinal cord pathology (disease). Restless legs syndrome and periodic limb movement disorder affect 20-40% of persons with chronic renal (kidney) failure who are on dialysis. A history of iron-deficiency anemia is also common in persons with restless legs syndrome and periodic limb movement disorder.